Josiah Kloepping hits a pair of free throws after East Troy’s Darryl Rayfield was given a technical foul. 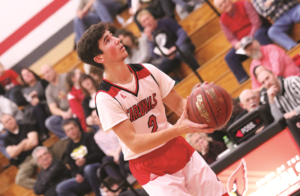 The Brodhead Boys hosted the East Troy Trojans last Friday night for a Rock Valley Conference matchup. The boys knew they would be in for a tough battle, as East Troy carried an undefeated conference record, and sat at 9-1 overall coming into Friday night’s game. Meanwhile the Brodhead boys came in holding a 3-7 overall record. Things were back and forth from the start as both teams got off to a hot start offensively. After tying things at 8-8, the Cards managed to take a slim 1-point lead early on. East Troy quickly answered however, as the Cardinal defense seemed to have no answer for the fast paced Trojan offense. That was the last time Brodhead would hold the lead in this one.